Public servants in the provinces are being given opportunities through specific training under the Pacific Leadership and Governance Precinct to gain skills and knowledge that will drive improved service delivery, economic opportunities and community development at the provincial and district level. Department of Personnel Management Secretary John Kali welcomes public servants to the launch of the courses. 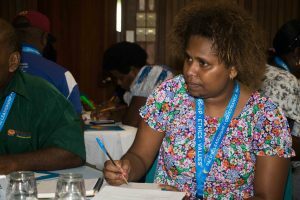 The Pacific Leadership and Governance Precinct launched two courses in Kokopo last month, which were attended by 57 participants. 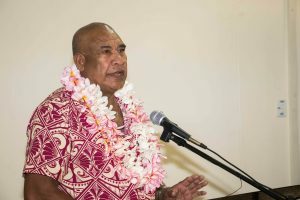 The courses, Project Management and Public Speaking and Speechwriting, were launched by Public Service Minister Elias Kapavore, Department of Personnel Management Secretary John Kali, Acting Provincial Administrator Wilson Matava and Penny Dennis, First Secretary at the Australian High Commission. The Precinct is increasingly focused on the development of provincial and district leaders, in line with Government of Papua New Guinea’s decentralisation agenda. Mr Kali told participants that ethics and values-based leadership was crucial for service delivery in regional areas. “Throughout the next few days you will be touching on some of these values, such as wisdom, honesty, integrity, respect, responsibility and accountability,” he said. the Public Speaking and Speechwriting course. “Accepting the invitation to attend these courses means you are accepting the challenge to come and make a difference – upgrade your skills and upgrade your confidence, so we can respond positively in the way we deliver services,” Mr Kali said. Mr Matava said it was important to embrace opportunities to improve the public service at the regional and national levels. “Programs like these improve capacity and our performance in the front line,” he said. Ms Dennis said the launch of the courses supported the Papua New Guinea-Australia partnership for improved decentralisation and service delivery. The Precinct is a partnership between the Governments of Papua New Guinea and Australia to support the development of ethical, capable public sector leaders throughout PNG.